High quality content . Still a query . I have SQL 2008 cluster with shared storage between them.i now want Dr site with 3rd party product like neverfail / ca arcserve/Symantec vrr on single server . The primary site cluster is active/passive mode.each has tworoc . We have 2 proc license for primary site . Do I have to procure SQL license for dr SQL server ? . Can I keep my secondary server to have single proc and that at dr server to be single proc and save on license ? If we need to procure license , can I have single proc license with single proc server at dr ? From the way I have understood the licensing, there is a direct relationship between the primary and secondary instances. 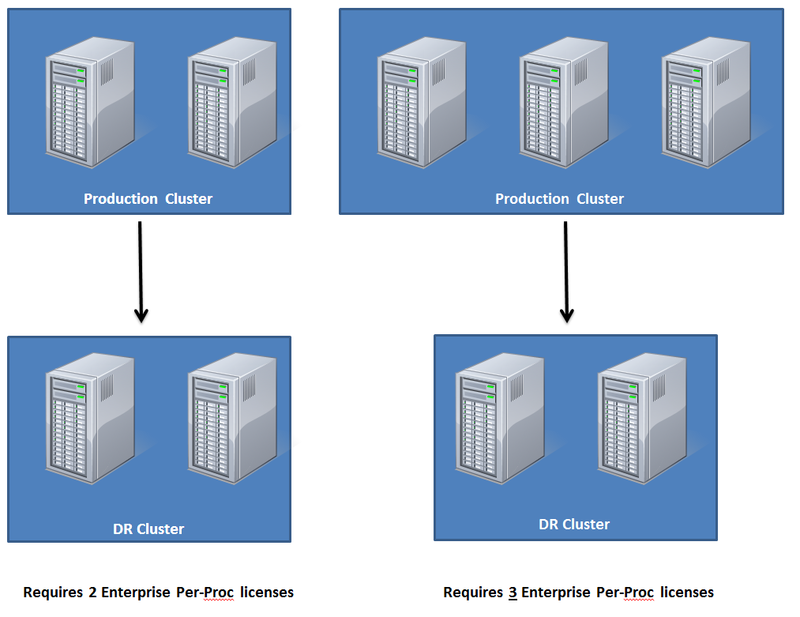 Meaning, that if you have a 2-proc server with 2 per-proc licenses, you cannot split the secondary into 1 proc being part of your cluster and the other being part of your DR solution. I wish this was not the case, but, as I understand from the documents and from Microsoft’s people, it is, indeed, the case. So, for the scenario you have, you may be better off making your SQL Cluster Active/Active, buying another set of per-Proc licenses for that second node, and then install one instance on each node and then they can either share the same DR server or have two DR servers, or maybe a DR SQL Cluster. I hope this is clear, let me know if I have not explained this sufficiently. Hi there, I know this is a very late post. However, I was wondering if this was ever ratified by Microsoft. My company is going through an audit shortly and my setup is pretty much that. David, I do not know of any specific ratification that Microsoft has issued for any of the information I posted, but I did reference their licensing document as of SQL Server 2008. Their licensing has changed dramatically in the past few years and that should be taken into account. But, based on the documentation from Microsoft and other members of the SQL community with which I have discussed this, I believe the contents of the post to be accurate for SQL Server 2008. Please note that in recent versions of SQL Server, SQL Licensing is based on Core-count with minimum core-counts. Additionally, free cold secondaries are now only allowed with Software Assurance. Also, SQL Azure does not allow free cold secondaries at all. Waht if active node require to be restarted because of Microsoft updates installation and for thouse few minutes passive will take the role. Do I need license the pasive node because of this? I apologize for the delay in answering. If the Primary node needs to be restarted and the Secondary node takes over the load on the database during that restart, the Secondary node is covered under the Primary node’s license. Microsoft allows for up to 90-days in this mode for a node-fail-over scenario.